We are delighted to present the ‘Mixed Reality Tech Lab’ in the Future Zone of IBC2018. Powered by the disguise media platform, this fully-immersive production environment will showcase the latest developments in workflows for live broadcast. We will use the Tech Lab to demonstrate the results of our ground-breaking R&D and showcase the benefits of creating flexible small production spaces. There will also be discussions around how the industry can effectively adopt augmented, virtual and mixed reality workflows. Want to see a live demo? Book a meeting with the team. Earlier this year, we worked closely with Discovery Eurosport on their coverage of the PyeongChange 2018 Olympic Winter Games. 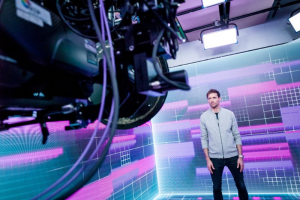 Alongside overseeing the entire studio technology, we helped develop the Eurosport Cube: a mixed-reality studio that created a fully-interactive environment for Eurosport’s presenters to engage with. We are thrilled that The Eurosport Cube has been shortlisted in the IBC Awards Content Creation category! Want to see a live demonstration of the Mixed Reality Tech Lab? Book now!